When you’re building a new home or renovating an older one, one of the biggest design decisions that must be made is what type of flooring to put in each room. And this decision doesn’t just affect your home’s looks. Different types of flooring can have different effects on the indoor air quality of your home. It also effects the energy efficiency. To choose the best flooring for each room in your home you consider cost and style. Consider these HVAC-related factors, as well. When it comes to indoor air quality, wall-to-wall carpeting can cause some serious problems. Carpets can hold on to common indoor allergens like dust mites, pet dander, and mold spores. This is according to the American Lung Association. Vacuuming or even just walking across the carpet can stir these allergens up, releasing them into the air you breathe. The ALA warns that children are particularly susceptible to being exposed to allergens in carpets. This is because they often sit and play on the floor. In fact, according to a study reported in the International Journal of Environmental Research and Public Health, carpeting in the bedrooms of children under age 5 was associated with an increased risk of developing childhood asthma. 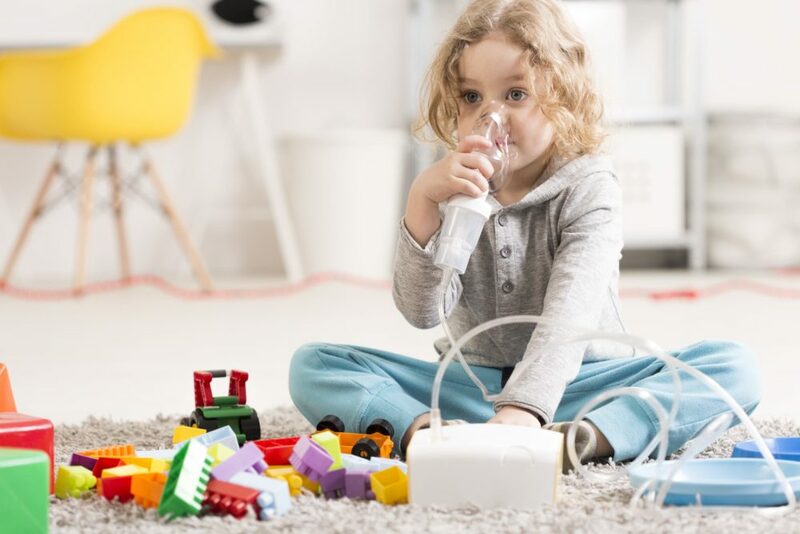 Several related studies found increased risks for wheezing, coughing, respiratory infections, and hospitalization due to asthma attacks for children who had carpeting in their bedrooms. Did you know carpets trap many indoor pollutants? The ALA actually recommends that if you have carpeting, you need to vacuum it at least three times a week with a vacuum that has a HEPA filter. That’s a lot of time and energy spent vacuuming! Additionally, the ALA recommends having all wall-to-wall carpets steam-cleaned once a year. However, you must make sure that the carpet dries completely afterwards. If not, you’ll end up with another problem associated with carpets: mold! Another indoor air quality problem associated with wall-to-wall carpeting is mold. Hawk Environmental Services warns that carpets absorb water and can easily stay damp. This can happen whether from spills, leaks, or just high humidity. Damp carpet can be a breeding ground for mold. According to the ALA, carpet should never be used in bathrooms, kitchens, or even entryways. This is because those areas are often damp. Again, it’s very important that any carpet be kept clean and dry in order to prevent mold growth. See Also: How Does Humidity Affect Your Indoor Comfort? Carpeting can have negative effects on indoor air quality, but one reason that it may be chosen for flooring is its insulating effect. Carpet can make your home a bit more energy efficient. Home Flooring Pros notes that a carpet combined with a dense polyurethane foam pad has an R-value of about 2.5-3.0. That’s not a lot, but it can give your floor’s insulation a little boost. Plus, carpet just feels warmer under your feet, which might make it easier to turn down your thermostat a degree or two. However, the ALA recommends that if you want something warmer under your feet, you choose rugs instead of wall-to-wall carpeting. The rug can be removed and thoroughly cleaned outdoors, helping to avoid the problems of allergens and mold associated with carpets. According to the US EPA, volatile organic compounds are a variety of chemicals that are emitted as gases and can have a wide range of negative health effects. These health effects include ear, nose, and throat irritation; headaches; nausea; damage to the liver and kidneys; and increasing the risk of certain cancers. VOCs are emitted by many common household building materials and products. As the EPA reports, paints, cleaning products, drywall, adhesives, and various types of flooring can all contain and emit VOCs. Indoor air quality can be seriously affected by a build-up of VOCs, especially in highly-efficient homes that don’t have enough ventilation with outside air. The ALA warns that some new carpets emit VOCs. The pads and adhesives used when installing them also can have then. However, this isn’t just a problem with carpets. According to the Environmental Working Group, some types of laminate flooring have been found to emit high levels of formaldehyde. This is a VOC known to cause cancer. Vinyl flooring may also emit toxic gases such as phthalates. Additionally, the glues used to install some hardwood floors, tile, or carpets may emit VOCs as well. Fortunately, today many manufacturers offer low-VOC options in various types of flooring. And there are also alternatives available for installation. When deciding between flooring and installation options, look for lower-VOC alternatives to help protect your home’s air quality. The ALA even suggests having new carpet unrolled and aired out in the warehouse for 72 hours prior to installation, if possible. Additionally, they suggest staying out of your house and ventilating it well for 72 hours after installation. See Also: Why Does My AC Smell Like…? The flooring you choose can have a big impact on your family’s comfort and health. Whether you’re building a new home or renovating an older one, consider how your design choices will affect indoor air quality as well as comfort and style. You’ll be glad you did!